It is not uncommon to see beautiful moss wall installations in hotels and across the hospitality industry in their lobbies and occasionally in a meeting room, but what we have not seen (yet) are the hotels that adopt a moss design piece for every room. We’re going to share the ways that moss designs can solve three specific hotel challenges: odors and sounds and aesthetics. We, of course, keep numerous moss frames in our home and we have also been conducting a great deal of testing in our workshop and in the homes of friends and we can proudly report that moss solves three of the challenges that every hotel, motel, bed and breakfast, or Airbnb manage as they work to provide a pleasant experience for their guests. We all want our hotel rooms to smell neutral. Hotel rooms can easily trap the odor of the last guest’s cologne or smell strongly of cleaning chemicals (see previous post for information on Tersano, a green cleaning solution minus the unpleasant chemical odor that is much, much healthier for employees too) Moss not only mitigates odors (pleasant and unpleasant) it also cleans the air of volatile organic compounds (VOCs). We will spare you the details on the various smells we have used to test the capability of our moss but suffice it to say that everything from cologne to bacon grease and cigarette smoke, the moss mitigates odors and leaves the room smelling fresh and, well, neutral. We have all been in a hotel room and overheard *ahem* noises we may not have wanted to overhear. From the amorous couple to the crying baby in the room next door, to the slamming hotel doors, we have all experienced noises that woke us from a dead sleep or simply made us feel a little squirmy. Moss is a wonderful soundproofing material. As noted by the Benholm Group in the U.K., designers are specifying moss walls with increasing frequency because they significantly reduce noise and do so with no need for maintenance. Even in the busiest of hotels, the only maintenance that may be required is some light dusting using compressed air, just as you would use on a computer keyboard to clean it. Buzzispace, the large international manufacturer of soundproofing materials gets that and they worked with Cory Grosser and Associates to create an entire line of moss soundproofing panels. You can view the work and the high praise Apartment Therapy gives the product in their post, titled “This Living Wall Is The Most Gorgeous Soundproofing Option We’ve Seen.” Yes, they are referring to preserved moss in this instance and you can read the full detail on the difference between moss walls and living plant walls. 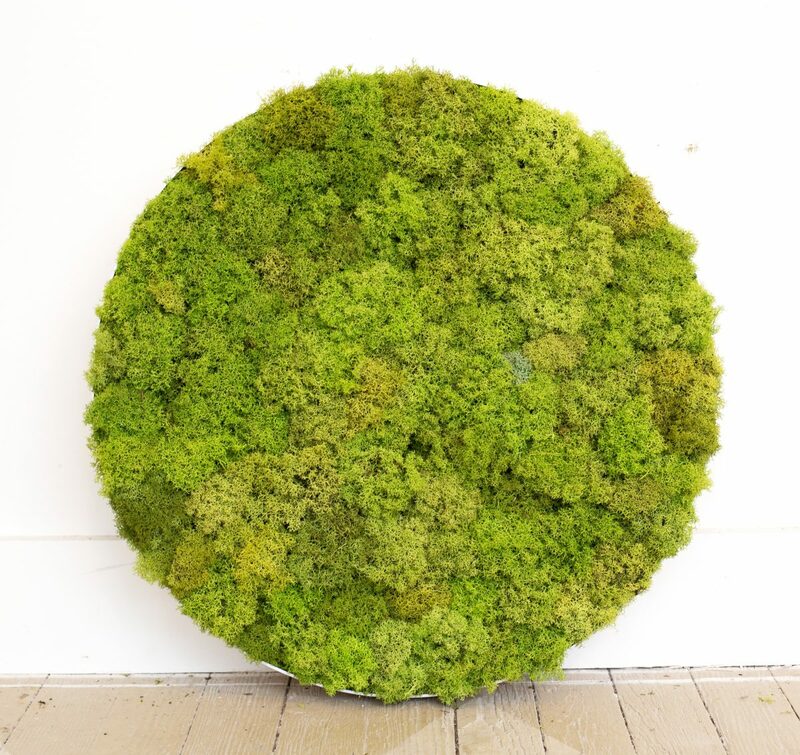 What’s germane here is that Buzzispace calls that line of products BuzziMood because they also get how moss can enhance creativity and improve mood. Honestly, all biophilic elements aid in making us happier and while at The Fat Plant Society, we are partial to moss, we are collaborating with other designers in stone and wood manufacturing to enhance the options we can provide you for biophilic design. Last and certainly not least, moss is incredibly aesthetically appealing. Okay, truthfully, we have a secret collection of hotel room art photos because we are often amazed (not always in a good way) at the art that appears on hotel room walls. Obviously, the goal of the hotel room designer is to create a space that is visually appealing but does not cater to a singular artistic taste. that is not easy to do. And, as it turns out, we are not alone in wrinkling our noses at unattractive and sometimes, downright ugly art hanging in hotel rooms. Comedian Amy Sedaris actually worked with the Super 8 Hotels (owned by Wyndham) to remove and relocate many, many pieces of “bad art” from the Super 8 Hotels. In a laugh out loud, killer article by Micah Solomon for Forbes Magazine, Solomon details the program, complete with Sedaris’ commentary (totally worth the read, it’s hilarious). Like many boutique hotels, Super 8 went the way of the Terroir approach–going hyper-local to feature the work of local artists renderings of local landmarks and/or using photography (historical and otherwise) to demonstrate (and possibly remind?) the guest, where they are in the world. Don’t get us wrong, we love local art and photography as much as the next guest but paintings and photographs do not clean the air and do not dampen the sound of your neighbors next door. You may be thinking that we are overlooking how hard guests are on the rooms and furnishings but you would be surprised at how sturdy moss really is. It is very difficult to pull a chunk out of one of our designs and touching it does not harm the moss. In fact, for larger installations, we actually build the wall in 2-foot by 2-foot frames so that if a single panel is damaged, we can easily replace it. To date, we have not had to replace a single panel or moss design frame. Frankly, they are as sturdy as any painting or photograph, but with benefits. At The Fat Plant Society, we are heavily influenced by Danish Design principles (one of us was born and raised in Copenhagen) so clean lines and simple, natural designs appeal to us and you can see that in the designs we create for our clients. Additionally, lighting plays a major role in the look of the moss so the same moss design will look different depending on the lighting under or above it. We work to ensure our designs are appealing, not jarring. That they engage, not startle or frighten. And we have yet to meet anyone who says “I hate how moss looks.” It’s kind of like saying, “I hate the look of trees.” These are the natural elements that we, as humans, have attended to for centuries and that is not only not going to change, our understanding of the impact of biophilic design on our wellbeing is increasing. We’d like to see the “greening” of hotel rooms across the nation because it also demonstrates to the guest (along with those placards about only throwing the towels you want washed on the floor) that they care about the environment as much as they care about their guests. Feel free to make that humble suggestion at the front desk the next time you see, smell, or hear something in your hotel room that makes it hard to relax and sleep. Is there data to suggest that preserved moss mitigates odors and cleans air of VOC’S? Or is live moss only capable? Greetings and thank you for your question–sent you an email with links (that can also be found in our blog posts) to studies and data. That email may have ended up in your spam, happy to resend if you wish. Thanks again for your question and all the best.